With a recent visit to Cornwall planned to see my parents they thought it would be nice to take us out for a Sunday roast. All we had to do was suggest somewhere to go? I jumped on the computer and typed in ‘Best Roast in Falmouth’ and at the top of the Google results was a review which rated The Waymarker between Falmouth and Gweek highly. Trip Advisor has a few reviews on The Waymarker and upon reading them I thought it was definitely worth a go. After a quick email it was all booked up for 1pm Sunday. Well, what a Cornish Gem – The Waymarker is a timber frame construction built in a tranquil old granite quarry at Trewardreva, Constantine. With beautiful countryside surrounding the building and plenty of outside seating I imagine it would be a great place to stop off to relax on a warm and sunny day. We opted for the more civilised indoor seating arrangement as we were having a cooked meal. After hearing the rave reviews online we decided to all go for the roast beef. Whilst we waited for the meal my parents had a couple of shandies and Becky and I thought we could try some local beverages. Becky went for an Elderflower Presse made in Duloe by Cornish Orchards while I went for a more alcoholic option of a real ale. Lizard Ales of Coverack, on the Lizard peninsula brew half a dozen different ales in an old nuclear bunker and I opted for the classically named Kernow Gold. A cracking light and refreshing ale suitable for lunchtime drinking. With the drinks going down well, it was not long before our meals arrived. Wow, they looked mouth-watering! It transpires that Rhiannon who runs The Waymarker is a farmer’s daughter. That combination of farmers daughter and cooking will usually result in a hearty meal especially when roast Beef and fresh veg is concerned! It was a really great meal, friendly service and an idyllic location. 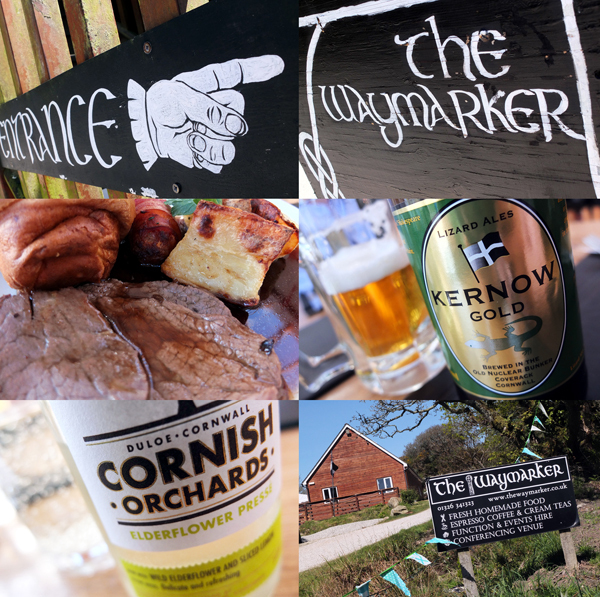 So if you are in the area, its well worth trying this little gem tucked away off the beaten track between Falmouth and Gweek. 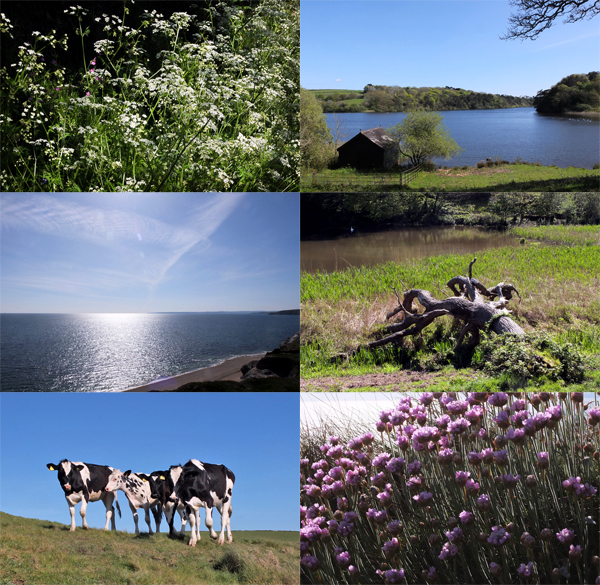 After that delicious meal we had to try to walk some of it off so headed for the Penrose Estate to walk down to Loe Bar via Loe Pool. Loe Pool is a fresh water lake located on the Penrose Estate with a shingle bank separating it from the sea. Measuring 50 Hectares (500,000 sq metres) it’s quite a large lake that we later realised. Becky and I headed off as my parents wanted to take a more leisurely stroll and not walk all the way to the sea. It’s a ride I have done on my bike before but never on foot – Dad did say its a ‘Hell of a walk’ – He was right! After a 40 minute walk we realised just how much further we would have to walk around Loe pool before then turning around and walking all the way back. Not wanting to keep Mum and Dad waiting too long we turned around and headed back with the idea of driving to Loe Bar car park and walking along the clifftop to see the bar, the pool and the sea. The scenery around the pool, the bar and the south Cornish coastline is just stunning. The clear blue skies and the fresh vegetation were just glorious. Its well worth a walk for the able-bodied person, next time we will plan to take all day to do the walk and take a lunch with us to have on the beach (bar). A word of warning. Do not attempt to go into the sea on Loe Bar, there are very dangerous under currents here coupled with the steep shingle bank which acts like quicksand so do not even consider stepping foot in the water. Several lives have been lost along this stretch of coastline. So be safe and keep out of the water! The dangerous swimming conditions and remoteness keep this beautiful beach off the bucket & spade brigades go to lists – excellent. Check out how quiet it is on a Sunday afternoon! We finally got back to Falmouth, where we went up to Pendennis Point to admire the view…… and have a Mr Whippy too!